Hrafnkels saga Freysgoða. Hrafnkel is his name, godi means priest though it also came to mean chieftain or secular power, and Frey was the Norse god of fertility. So: the saga of Hrafnkel the priest of Frey. Hrafnkel Frey’s Godi is well-known for being one of the shortest and most focused of the sagas, telling its story with clarity and directness. In the Penguin edition it has 16 chapters; in the 1882 free online translation by John Coles it has 20. 1 – In the days of King Harald Fair-Hair (870-930) a man called Hallfred brings his wife and son Hrafnkel to Breiddal in Iceland. In a vision a woman tells him to move his house which he does and avoids an avalanche. The new place is named Hallfredsstadir. 2 – Hrafnkel comes of age and builds his own farm in Jokunsdal which he names Adalbol. He builds a large temple to Frey. He settles the valley and imposes himself on the population as their godi. He is not a good godi, being unfair, not paying reparations etc. 3 – A man named Bjarni lives on a farm at Laugarhus. He has sons, the argumentative lawyer Sam and Eyjolf who adventures abroad to Denmark and onto Constantinople. Hrafnkel reverences one stalion which he dedicates to Frey and names Freyfaxi and forbids any man to ride it. 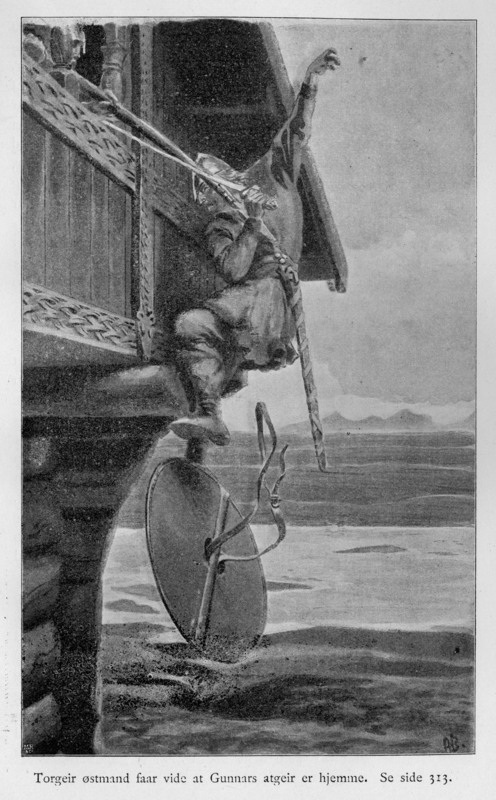 4 – There is a farmer named Thorbjorn, Bjarni’s brother. He is not well off and has many dependents. Thorbjorn tells his eldest son Einar he needs to get a job. Einar rides over to Adalbol to see Hrafnkel who has filled most of his vacancies but can offer him the job of shepherd, which Einar takes. Thee is one condition: he must not ride the stallion named Freyfaxi. Hrafnkel will kill any man who rides it. 5 – Einar does well all summer but one day wakes up and thrity sheep are missing. He needs to find them but when he goes to round up a horse to ride all the others run away. Except Freyfaxi who, as one fated, stands stock still while Einar eventually decides to saddle and ride him. Einar rides freyfaxi all round the hills looking for the sheep and eventually finds them where he started. As soon as he dismounts Freyfaxi, covered in mud and sweat, bolts down to the farmhouse where a woman reports his state to Hrafnkel who is angry. Next morning he rides up to the sheiling, confirms that Einar did indeed ride his horse, and kills him with one axe stroke. He buries his body in a shallow grave at a place which becomes known as Einarsvardi. Adalbol to complain to Thorbjorn. Thorbjorn concedes it was a bad deed and offers him the pick of his cattle, placements and advancement for his sons and daughters, and free choice of what he’s got in his home. But Thorbjorn insists on independent arbitration ie that he be treated as an equal, and this Thorbjorn scornfully refuses. Thorbjorn rides on to Laugurhus to his brother Bjarni who thinks he’s stupid for turning down Hrafnkel’s generous offer. and on to Leikskalar to see Sam, his brother’s son, who he persuades very reluctantly to take over the case (of, after all, avenging his cousin). 7 – Sam observes the formalities of Icelandic law: he rides to a farm, gathers a crowd, and accuses Hrafnkel of the murder. Then goes home. Summer passes and winter then in spring, in the Summons Days, Sam rides to Adalbol and formally accuses Hrafnkel of the murder. Hrafnkel assembles a posse of 70 retainers and rides to the Althing. Sam musters as many unattached men as he can and rides to the Althing by a different route. He and his uncle Thorbjorn go round the booths asking for support but no-one will help as they all say Hrafnkel wins all his case, and Sam is no kin of theirs. 8 – Thorbjorn says maybe they shouls pack their bags and head home. Sam says he’s got him into this mess and he’s going to see it through to the end. Just then a man with a streak of white hair comes walking by. He is Thorkel Thjostarson just returned from Constantinople. He has brothers Thorgeir and Thormod. After having Sam’s situation explained Thorkel says he will support him. 9 – The elaborate ruse of stumbling over Thorgeir’s sore toe leads the brothers to argue, Thorgeir saying Hrafnkel always wins, Thorkel can have the godord back if he wants etc. Thorkel refuses all this and talks Thorgeir round into supporting Sam and old man Thorbjorn. 10 – The Thjostarssons muster at the Law Rock while Sam presents his case flawlessy. When Hrafnkel is told he thinks he’ll just ride up there and scare them off, but the throng is so great he can’t make his way through and so doesn’t have chance to present a defence (!) and so is sentenced in his absence to full outlawry. Thorkel says Hrafnkel will probably ride home confident in the knowledge that Sam won’t do the necessary follow-up ie serving notice of the outlawry in person. Thorkel says he his brothers and retainers will help. So they all ride across Iceland to the east (15 days) arriving at Hrafnkel’s valley on the morning that the confiscation court is meant to be carried out. 11 – Sam, the Thjostarrsons and sixty (!) of their retainers run down to the farm and terrorise the people. They lock all the women and children in a barn. They then pierce the ankles of all eight of the men and hang them by the ankles by a rope over a beam. Thorkel and Sam discuss what to do. Thorgeir and Sam go to a knoll an arrow’s shot from the farm to carry out the confiscation court. Hrafnkel offers self-judgement and Sam says he is going to spare him, but confiscate his farm, all the land and livestock and also Hrafnkel’s godi or chieftainship. Hrafnkel packs all his people and belongings and leaves Adalbol that day. He migrates east and buys a poor farm but by sheer hard work builds it up and names it Hrafnkelsstadir. 12 – The Thjostarssons advise Sam to be wise and just to his new thingmen. They examine the horses and don’t see anything special about Freyfaxi, but decide they must give him back to his part-owner (the god) so they set a stone around his neck and push him over a high waterfall, ever since known as Freyfaxahamar. They strip and burn Frey’s temple, then depart on excellent terms with much gift-giving and return west. 13 – When Hrafnkel hears the Thjostarssons have stripped his temple and burned the idols he abandons paganism, ceasing to sacrifice. Hrafnkel thrives, acquires wealth and, as the land east of Lagarfljot becomes populated, he builds a great following of thingmen. He is a wiser and kinder man. 14 – One day Sam’s brother Eyvind returns from long merchanting abroad. He is rich dressed in fine clothes. Sam sends him horses and Eyvind, four merchants and his boy set off with pack horses towards Adalbol. A erving woman washing linen in the river watches them go by and, as so often, goes to report it to Hrafnkel and goads him, taunting that people grow soft with age , and what an opportunity this would be for revenge. Hrafnkel musters his supporters and 18 of them set out in pursuit. This chapter is famous for the highly-detailed description of the lie of the rivers, bogs, lava fields which the two parties cross. Eyvind’s boy repeatedly advises him to flee but Eyvind refuses to flee someone he hasn’t offended. Hrafnkel caches him up and massacres Eyvind and his troop. The boy had fled fast to Adalbol where he tells Sam but by the time Sam and supporters arrive his brother is dead. They give chase but Hrafnkel is too far ahead and makes it home safely. 15 – Hrafnkel makes a surprise attack on Sam with no fewer than 70 supporters and catches him in his bed. He offers him death or self-judgement, which Sam accepts. Hrafnkel turfs him out of Adalbol, telling him to take only what he brought. Hrafnkel will resume living there and resume the godard and Sam will live back on his farm in Leikskalar with his kin. Which is what happens. 16 – Sam rankles. He rides west to visit the Thjostarssons asking for help. But this time they turn him down. They told him to kill Hrafnkel when he had the chance; now he is reaping the result of ignoring their advice. And no, they refuse to ride all the way out east to take part in further fighting. They offer gifts but Sam refuses them and rides home disgruntled. He lives out his life in this lowly position, never achieving revenge. Hrafnkel by contrast lives in honour till he dies of an illness. His properties are divided between his sons. It seems probable that the peg of the narrative, the specialness of Freyfaxi and his standing still to tempt Einar, his running to his master after being ridden, and his ultimate sacrifice, may have origins in pagan horse-worship. But there is nothing else supernatural or uncanny in the tale, unlike most sagas which have plenty of omens and prophecies which suggest to me the theory of a 13th century author setting out to create a novella and using disparate elements which were to hand. What strikes this reader is the complete alienness of the concepts of justice and honour which permeate the saga. It is difficult to understand that Hrafnkel can be tried and sentenced at the Althing without even appearing to make a defence. It is boggling that, having thus been outlawed, Hrafnkel can be attacked, tortured, maimed and killed by Sam with no comeback, and so can his farmhands. It is terrifying that quite out of the blue Hrafnkel can murder Eyvind and four completely uninvolved merchants and, again, not only get away scot-free but regain all his lost possessions – and be universally judged the winner! Obviously intended by the author to deserve to be held in high honour and esteem for sitting things out and finally getting his way. The complete ‘otherness’ of the entire system of values of the sagas completely overshadows the minor issue of whether the stories are oral history or fiction or a combination of the two. They are powerful insights into a mindset which is so alien to ours in almost every way that they almost amount to science fiction. 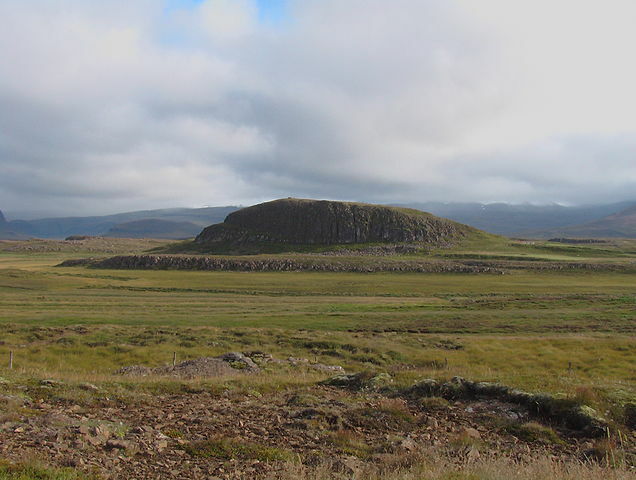 The saga of Egil Skallagrimsson is said to be one of the masterpieces of the genre, along with the sagas of Grettir, Njal and the people of Laxdale. The saga is 90 chapters long. Typically the eponymous hero only appears in chapter 31, over a third in, and is old and ceases to play much of an active role by chapter 80 – ie as with all the other sagas one man’s life is deeply embedded in the lives and stories of his forebears and ancestors. That first third is devoted to the collapse of the relationship between Norwegian King Harald Fine-Hair, or Tangle-hair as is here translated, and one of his leading men Thorolf Kveldulfsson. In brief Thorolf serves the king excellently but is the victim of slanders made by the sons of the second marriage of a man whose property he inherited via his friend, the grandson. In their bid to regain the property they think rightly theirs, the sons convince Harald Thorolf is a traitor plotting his murder and Harald first deprives Thorolf of his role of King’s tax collector, then surrounds his homestead, burning it (as in Njal’s saga) before massacring the men who run out. Thorolf’s downfall convinces Egil’s father Grim the Bald (Skallagrim) and many of his kinsfolk to flee Harald’s dictatorial behaviour for the newly discovered and unpopulated island of Iceland. One thing which makes Egil’s saga easier to read than most is that it is firmly embedded in a historical framework. Egil’s family are entangled with successive kings of Norway, Denmark and England. The first third of the saga is the story of Egil’s uncle Thorolf’s doomed relationship with King Harald Fine-Hair. Once he has reached adulthood, Egil sails back to Norway where he has difficult relations with Harald’s son Eirik Bloodaxe, serves King Athelstan of England in battle against King Olaf the Red of Scotland, and falls foul of King Gorm of Denmark. The known dates of these kings, their battles and successions, although a bit mangled in the saga, nonetheless give the reader a fixed and logically unfolding framework or chronology in which to situate the narrative. Unlike, say, the Eyrbyggja saga, where obscure events relate only to other obscure events, and unknown characters relate to lots of other unknown characters, creating a tapestry of confusion. I’ve read blurb saying Egil is an ambivalent figure. He’s not. He’s a violent psychopath. He kills lots of people. As a youth he is unnaturally large and ugly and strong. He commits his first murder aged seven and doesn’t look back. 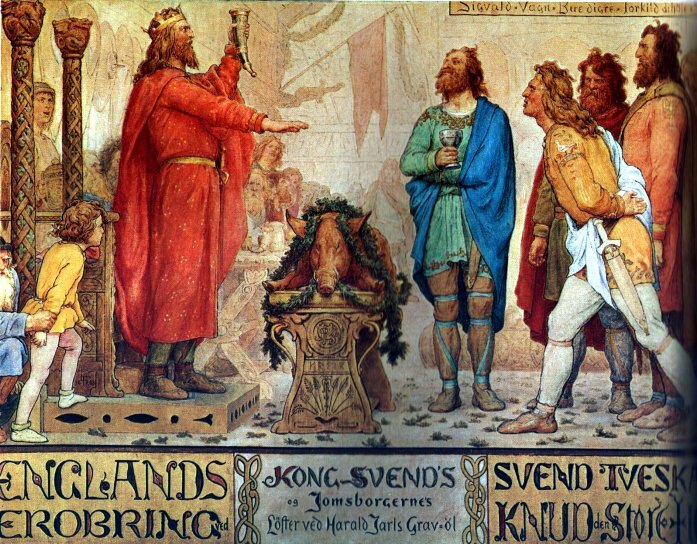 He kills Bard at the feast where Bard is hosting King Eirik Bloodaxe along with his queen Gunnhild. 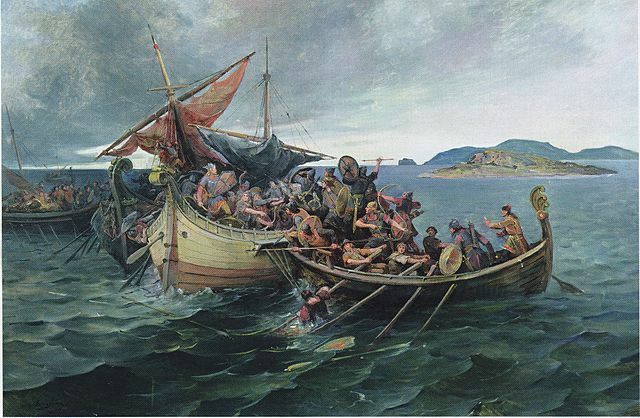 He kills all the men in the boat Eirik sends after him, including Eirik’s son prince Rognvald. that my violent deeds might be repaid. of warlike Eirik and Gunnhild’s son. of battle is hard at work. He kills all the men he confronts in battle fighting for King Athelstan. He kills Olvir. He kills Berg-Onund and Frodi and Hadd. And the appalling savagery of Viking mentality is described with blunt factuality as Egil and his brother Thorolf go a-viking, killing countless farmers and their workers, stealing everything they can carry, burning everything else. His poetry is meant to redeem Egil. It’s hard to tell from the translations. These are very good, lucid and atmospheric, but I’m not qualified to compare them to any other skaldic poetry embedded in 13th century Icelandic sagas. the shield when I brandished it. its edge with his magic. my teeth removed that peril. Thus I vanquished the beast. But obviously the poetry is key to the character of Egil as conceived or recorded in the tradition and he creates and speaks verse at most of the major events in the story. It’s striking that this poetry is appreciated by all and sundry with none of the pretentiousness which has surrounded it in the West since the Romantic revolution (?1800). The crudest warriors repect the power of well-articulated speech. Good verse can temper very bad opinions of its author: when he falls into King Eirik’s grasp Egil is about to lose his life but manages to save it by writing and reciting a 20-verse drapa in Eirik’s praise, even though, once he’s escaped, he makes it clear he didn’t mean a word. The poems lend this saga something unique, which is psychology. They give an insight, albeit oblique and objectified, of the characters’ feelings. Thus, despite the monstrousness of Egil’s behaviour, the poems – which become increasingly softer and more elegiac as he ages – lend the text a deceptive sense of gentleness. Despite his hideous behaviour, it is hard not to respond to the sad tone of the final poems of his age and infirmity. and spread gifts like the gold of day. in return for my words of praise? The translation is by Bernard Scudder and from The Saga of the Icelanders. It is excellent, clear, concise and modern, with no jarring archaisms or dated colloquialisms. It reads as if it is being told now. Big book, enormous subject. Just as well we’re in the company of such an immensely knowledgeable and charming companion – medieval historian Richard Fletcher. Sadly Dr Fletcher died in 2005 – read the Guardian obituary – but his works live on, and this is his masterpiece. The Conversion of Europe: From Paganism to Christianity 371-1386 (1997) forms a great companion to Robert Ferguson’s brilliant book about the Vikings, The Hammer and The Cross (2010). The ‘Viking Age’ was roughly 800 to 1100. Ferguson describes in forensic detail the brutal, masculine world of the barbarian raiders from the seas, heathens from beyond the pale of Roman civilisation, law and literacy; only slowly is their bloodlust brought under control as the various Danish kings and warlords are converted and baptised at the end of the 900s and into the 1000s. Ferguson’s thesis is that, shadowy and difficult to pin down as the definition of ‘Viking’ is, there is certainly one constant to all their activities: their super-violent hatred of Christianity. Christian centres are not just attacked, they are destroyed and the inhabitants exterminated. Covers a much larger period – from the emperor Theodosius banning pagan religion in the 380s to the conversion of the Lithuanians one thousand years later, in the 1380s – and a far wider canvas, from Scotland to Romania. Covers the same story from the other side, examining the administrative and cultural framework of Christianity as it developed inside the Pale of Roman administration, law and literacy, and then slowly extended beyond it. The main difference is that, compared to the Vikings, we actually have quite a lot of information about individual proselytisers because so many of them became saints (St Martin, St Columba, Patrick, St Augustine, St Wilfrid and so on) and had hagiographies (biographies of saints) written about them, often by followers who had personally known them and witnessed key events in their lives. By the 7th and 8th centuries, many of these pioneers can be shown either to have come from aristocratic families or to have had aristocratic or royal sponsors. After the obscurity of the 5th and 6th centuries, Fletcher’s book in the 7th and 8th centuries becomes like a tapestry or puzzle, wherein we can see the complex web of relationships between successive kings and their spouses and their missionary monks and priests, the evangelists pushing into new territory, the royals providing the money and material to build them new churches and monasteries, which become engines of education and learning, generating new mission-minded monks who themselves set off further north or south or east to copy the example of their sainted forebears. Slowly, slowly, by painstaking efforts, the whole continent is converted. The opening chapters move swiftly over Jesus (‘Christianity traces its historic roots to the ministry of a Jewish preacher and exorcist in a backward province of the Roman empire’, p.13), the missions of St Paul, the letters of the earliest fathers and martyrs, through to the ‘Eusebian accommodation’. The emperor Constantine plays a pivotal role in the history of Christianity because it was he who, in the Edict of Milan in 313, brought all Roman persecution of Christianity to an end and decriminalised Christian belief and practice. The age of persecution and martyrs ends in 313. Constantine was a practical man who set about establishing peace throughout the Empire, reorganising its taxes and laws, establishing a fundamentally new structure whereby the empire was divided into a western and an eastern half (the latter to be ruled from the new capital he established at the old Greek town of Byzantium which he completely rebuilt and renamed Constantinople). And he brought the same practical thoroughness to the up-and-coming religion which had now established itself throughout the empire, Christianity, calling councils to thrash out its beliefs, to have them set in writing and promulgated under his name, as well as sitting in judgement on the theological and administrative squabbles of the early church. Eusebius was court theologian to Constantine and, as well as the panegyrics he wrote to Constantine’s wonderfulness, he developed the idea that the empire and Christianity were intertwined: it was their destiny to work together, the wise and good Constantine providing the peaceful framework within which his holy church could save souls, the wise and good Church leaders providing the emperors with spiritual guidance. Now that it had adopted Christianity, the Roman Empire would be protected and supported by a loving God. The two would go hand in hand in peace and power. 100 years later this line of argument got into trouble when Rome was sacked by the Visigoths (410). Surviving pagan philosophers used this disaster to refute the argument that the Empire had been blessed and protected by Christianity: it looked very much the opposite, that abandoning the old pagan gods had led to disaster. Far away in North Africa, the great theologian Augustine was prompted the fall of Rome to write his huge masterpiece City of God (426). This completely rejected the idea of an accommodation between Rome and Christianity, and asserted a complete separation between the earthly city with its corruption and imperfection, and the divine City of God. The Eastern, Greek empire, stuck with the Eusebian ideal; the West with Augustine’s separation, with huge consequences. Augustine’s insistence on the separation of Church and State sowed the seeds of the long-running feud between the Holy Roman Emperor and the Pope, and between individual rulers and their archbishops and the Pope, a tendency which led to the rejection of central Church authority in the Reformation. All this was in sharp contrast to the Greek Eastern Orthodox tradition which followed Constantine’s wish of uniting church and state – leading to the arguably more authoritarian regimes of Orthodox countries, epitomised by Russia. Augustine’s pessimistic vision seemed to be confirmed when the Empire in the West collapsed and the last emperor was killed in 476. The slow decay of Imperial law and institutions eventually left the archbishops and bishops and abbots and monasteries – the papacy and the Church bureaucracy – as the only thing left standing to embody the literacy, legality and civilisation of the Roman Empire as the barbarians swarm across Europe. Why convert anyone to Christianity? In later years this would become known as ‘the Great Commission’ and was used in the era of European expansion and colonisation (1500 to 2000) to justify missionising to all the native peoples Europeans encountered. a) How very slowly it came about that the Church hierarchy even considered missionising beyond the urban centres – for a long time it was thought that you only needed a few converts in each of the ‘nations’ – and those mostly among the urban rich. ‘Surely that’s enough, isn’t it?’ Fletcher brilliantly describes how slow the notion of conversion and mission was to emerge. For centuries the authorities concerned themselves only with bringing the pagans within the Empire into the Church; that was challenge enough. He shows how Christianity was above all an urban phenomenon, and identified entirely with the wealthy and – once Constantine adopted it – with the extremely wealthy. These oligarchs fell over themselves to lavish land and bequests on the Church. In its earliest period Christian evangelisation was restricted to urban centres – St Paul’s epistles are to congregations in cities. Christian authorities followed the Roman prejudice that country dwellers were illiterate beasts. Only slowly did the idea develop that bishops should stamp out paganism in the countryside. b) And this extending of the faith beyond urban centres itself turned out to be a chalenging and slow business – such that popes and bishops are still writing about the scandal of pagan worship clinging on among the peasants well into the 600s and 700s. And not on the periphery, but right in the heart of the ‘Christian’ empire, in Italy itself, 20 miles from Rome – let alone in the further lands of Francia and Spain, or out in the wild frontiers like England. What were the converters up against? Fletcher builds the text by taking examples of figures both famous and obscure from across Latin Europe (Italy, France, Spain, England) and using the written records we have of them to investigate and compare their various motives, procedures, what they were up against (pagan resistance) and how much they succeeded. The great frustration of this subject is that we know so little about what so-called ‘pagans’ actually believed or did. A central part of the ‘conversion’ process was to destroy every single shrine, statue, holy tree and so on, a scorched earth policy as regards buildings and objects, and it’s the same with texts – not a single text survives anywhere which records the nature of pagan belief, compared to the thousands and thousands we have which record the holy sayings and wonderful deeds and pious activities of Christian martyrs, saints and teachers. In practical terms, this is because the Christians – of course – controlled the only means of storing and transmitting information i.e. writing. It appears that the pagans had no writing (apart, in some places, from primitive runes carved into stone) and certainly didn’t have the means of recording, replicating and storing writing which Christians established in the shape of monasteries full of educated, literate, text-copying monks. The Christian authorities decried the existence of arioli (singular: ariolus), holy men who uttered impious words at altars and offered sacrifices, who tied ligatures on the bodies of the sick and applied medicines. In 598 Pope Gregory wrote to the bishop of Terracina just 50 miles from Rome lamenting that local inhabits continued to worship sacred trees, in the pagan manner. And it wasn’t just the peasants who continued with heathen superstitions. A council of bishops at Toledo in 633 thought it necessary to forbid bishops, priests, deacons or any other clerical orders from consulting magicians, augurs, diviners or soothsayers (p.55). The power of these superstitious practices lingered on for centuries. In fact, in the final pages Fletcher gives records of Church authorities still trying to stamp out rural pagan practice in the 1600s! How did the converters convert pagans? While the Church elite was writing and arguing about high points of theology – which is what many histories of Christianity tend to focus on – down on the ground, among the peasants of the Touraine or Galicia or Mercia, individual evangelists were going head to head with the local deities to show that only the Christian God could end a drought, guarantee safe childbirth, prevent a flood and so on. The point is not only that the Christians could perform miracles – it’s that the pagan gods could too. High level theologians could dismiss pagan power as empty superstition but down on the ground, missionaries knew the pagan idols had power but they reinterpreted this power as coming from the Devil and his legion of demons – something they had good warrant for in the Gospel stories. All these people lived in a world dominated by cruel and capricious forces – incurable diseases, natural disasters, plague and famine, not to mention the unexpected attacks from rampaging armies which killed, raped and dragged survivors off into slavery. Traditional beliefs were the only science and the only technology they had to try and order and control and give meaning to their lives. It took a lot to dislodge these time-honoured traditions. Only by going head to head with the powers of the traditional gods could Christian missionaries hope to make even the slightest impact. Thus the records we have of missionaries throughout the period (300 to 1400, and beyond) tend to dwell on their miraculous works. St Martin of Tours, according to the written records we have of him, frequently encountered supernatural beings: the Devil several times, angels, demons, St Mary, St Agnes, Saints Peter and Paul, he had telepathic powers, could predict the future, could exorcise evil spirits from men or animals, and could raise the dead, as well as performing numerous miracles such as halting a hailstorm in the region of Sens. A letter he wrote cured the daughter of a Roman official just by being placed on her body. He cured a girl of 12 who had been dumb from birth. On one occasion he was cutting down a sacred tree and the pagans dared him to stand where it would fall so Martin did so and as the tree began to fall towards him he made the sign of the cross and it miraculously veered in another direction. The pagans cried with one voice that Christ was king and implored to be baptised. Bishop Simplicius encountered an idol being trundled about on a cart to bless fields and vineyards: he made the sign of the cross and the idol crashed to the ground while the oxen pulling the cart were rooted to the spot. Simplicius made 400 converts. Eugendus wrote a letter to a demon who was possessing a girl in eastern Gaul; the demon left her before the letter was even delivered. The lady Syagria, member of a leading aristocratic family of Lyons, was cured of a grave illness by eating a letter from Eugendus. Samson, grandson of the king of Gwent, was a native of Demetia in South Wales who made his way to England, received clerical training, and sailed across to Armorica in Gaul where he had a career as a miracle-worker, converting the pagan locals, and founding a monastery to preserve his name and build on his good work. In Trigg in north Cornwall he came across people who traditionally worshiped an idol. A boy was killed out riding. Samson told the people their idol couldn’t revive the boy but his God could and, if He did, they should abandon their idol forever. the people agreed. Samson prayed for two hours. The boy came back to life. The people destroyed their idol and agreed to be baptised. Again and again and again, in countless accounts of saints’ lives, it is clear that the chief tool in the armoury Christians seeking to convert both aristocrats and peasants to Christianity was their wonder-working, miracles, cures and exorcisms. These aren’t embarrassing details to be downplayed by modern believers – they are absolutely central to the success of the conversion effort. What’s more, they have their roots in the original gospels, where Jesus is nothing if not a wonder-worker, a miracle-maker, a curer, healer and exorciser, often pitched in direct conflict with the Devil and his demons. And Jesus’ powers themselves have their roots in the old Jewish scriptures in which heroes as far back as Moses have to fight against the power of the pagan gods, and prove – even to the sceptical Israelites – that Jehovah is Boss. As Fletcher points out, the Book of Psalms was the most widely read book of the Bible in the early medieval period, and its songs repeatedly stress the direct link between piety and worldly success, stressing ‘the causal relationship of correct cult with victory, prosperity and progeny’ (p.244). And he cites the story of Elijah who, in the first Book of Kings, chapter 18, goes head to head with the prophets of Baal and Asherah for an extended competition to see whose god is more powerful and can end the three years of drought. With predictable results, but results taken literally by two thousand years of Christian believers. Thus medieval superstition isn’t eccentric, it is part of a thousand-years-old tradition, and is intimately linked to the kind of folk beliefs which continued in the West until very recently, and continue to this day in many parts of the world. It is the post-Enlightenment despiritualising of nature and the world around us, it is the modern Western denial of magic powers and miracles, which is the historical oddity. Thus pagan shrines, idols and objects had to be destroyed, pagan practices quashed – and even descriptions of pagan practices suppressed and ignored – not in the name of a secular ideology, but because they had power. They weren’t just empty errors, they were the Devil’s work, they were the activities of the opposition – they represented a real and ongoing threat to the survival, and to the salvation, of the Christian community. Thus Martin and the hosts of other convertors like him didn’t just smash pagan shrines and buildings – they built over them. There was power in them which couldn’t be ignored – it had to be incorporated into the True Belief and redirected into the holy cause. It’s easy to forget how central Heresy was and is to Christianity – the history of early Christianity is mostly the history of heresies and, of course, Christianity is itself a heretical deviation from orthodox Judaism. The most disruptive among a host of types of ‘wrong thinking’ was Arianism, one of the countless deviations thrown up as clever men agonised over the mystery of the Trinity: if God is all-powerful, what is the relationship with the Holy Spirit mentioned throughout the holy texts, let alone with his Son? Is the Son equal in power to the Father? Are they the same entity? How much of Jesus was man and how much God? Did God give birth to the Son who is therefore less than the Father? Arius (c. AD 250–336) was a Christian presbyter in Alexandria, Egypt and he became associated with the belief that Jesus was begotten by the Father. Arius’s aim was not to dilute the power of the Father, to assert the absolute primacy and omnipotence of the One God. However, this had the effect of downgrading the Son and, by extension, of downgrading Jesus’s sacrifice: if he isn’t fully equal with God then maybe his sacrifice on the cross wasn’t fully earth-redeeming. Difficult though the philosophical niceties are to follow, the practical consequences are simple. For most of the 4th century the battle lines between Arianism and Orthodoxy hardened and embittered. Arius was anathematised during his lifetime and the newly Christian emperor Constantine (ruled 306-37) called the Council of Nicaea in 325 precisely to try and thrash out a form of words which would please all sides – resulting in the text which became referred to as ‘the Nicene Creed’. But so powerful was Arianism that the emperor’s own son, Constantius II (337–361) and his successor Valens (364–378), both in fact supported the Arian heresy, with the result that patriarchs and archbishops, bishops and priests were inducted into Arian Christianity – and that initial contacts with Gothic tribes and barbarians was with Arian missionaries. It was only with the advent of the zealously Catholic emperor Theodosius the Great (ruled 379-95) that Arianism was decisively defeated within the Church: Theodosius ordered all Arian writings to be destroyed and their authors vilified. But from the point of view of a history of Christian conversion, an important element of the early Middle Ages was not just converting the pagans, it was converting those who had mistakenly adopted the Christianity of Arius, back into the fold of Orthodoxy. Reading this book reminds the reader, yet again, that slavery has been an almost universal feature of human societies. Ancient Egypt was a slave society. The ancient Greek cities were slave societies, Athens was a slave state. The Roman Empire was built on slave labour. The Parthenon, the Forum, all that poetry and maths and drama – based on slavery. One of the major Roman exports from Roman Britain was slaves: we have written evidence and slave manacles and chains have survived. According to Bede’s story the official Roman mission to England was sent, in 597, because Pope Gregory the Great encountered some English slaves in the slave market in Rome. They were so attractive that the pope asked who they were. ‘Angles’, came the reply. ‘Not Angles, but angels,’ the pope quipped. Fletcher’s account of early missionaries to the Franks mentions ‘slaves from across the water’ i.e. the Channel, working for the French aristocracy. St Patrick was six years a slave. The Goths had slaves. The Huns had slaves. The Vikings took slaves wherever they went to sell in Europe’s slave markets. It is a recurring feature of missionaries that they are recorded as buying and liberating slaves in pagan societies, where possible. Every few pages in this 500-page-long book Fletcher mentions slaves. In one form or another (as serfs, as bonded labour) Europeans carried on enslaving other Europeans until the late medieval era. The later part of the book divides into long chapters dealing with Big Themes: the Greek missionary push into the Balkans and up into Eastern Europe (chapter 10), trying to convert the Vikings (Chapter 11), North-Eastern Europe and the Baltic (chapter 12). All of them are fascinating, tell gripping stories and shed light on the religious and cultural patterns of contemporary Europe. But one of the biggest ideas to emerge is in chapter 9 which assesses the early Medieval relationship with Judaism, and then with the sweeping military successes of Islam, which rampaged along the North African shore and up into Spain (completely conquered in the years 711 to 718), over the Alps and only being stopped in southern France at the Battle of Tours (10 October 732), where the Frankish King Charles Martel decisively defeated an army of the Umayyad Caliphate led by Abdul Rahman Al Ghafiqi. Charles went on to push Frankish domain south to the Pyrenees thus pinning the Moors inside the Iberian Peninsula, where they created the often stunning culture of Al-Andalus. But although the Christians held their own against Muslim assaults in southern France, in Sicily (threatening Italy) and in the East, where Islam swept through the Middle East to confront the Byzantine Empire – the net effect of the loss of the North African littoral to Christianity was to push the cultural and political focus of Europe north. Towards the end of this fascinating chapter, Fletcher describes a further seismic process, the slow partition of Christendom itself between Greek East and Roman West. It took centuries of disagreement, misunderstanding, occasional conflict, and a drift apart of theological and cultural practices – but Fletcher brings out another important element. For centuries after the collapse the Roman Empire in the West, Rome (and the pope) still came under the nominal protection of the Emperor in the East. But as early as 800 the papacy had recognised the power and protection of the Franks, when Pope Leo III crowned Charlemagne emperor in St Peter’s Basilica in Rome. And the diversion of the Emperor’s resources East to hold the Muslims at bay tended to make the papacy continue to look West, and North. A key moment in the breach came when the armies of the Fourth Crusade were diverted from the Holy Land and attacked Constantinople itself – theoretically to restore a pro-Western Emperor, but in reality the army ran riot and sacked the place, killing many of the inhabitants. The Muslim Conquests and loss of North Africa of the 700s – the triumphant creation of a huge Frankish Empire by Charlemagne in the 800s – the conversion of England, Scotland, Wales and Ireland in the 6th and 7th centuries, then of the Germans, Danes and Poles in the 9th, 10th and 11th centuries – alongside the collapse of Byzantine power which was crystallised in 1204 — all these factors ensured that Roman Catholicism, though based in Rome, would gravitational pull towards the North, around the court of France for a long time, and then the long stormy relationship with the various Holy Roman Emperors of Germany. – I’ve always liked the fact that the Emperor Constantine, the man who legalised Christianity in the Roman Empire, thus guaranteeing that Europe would become Christian with all that meant for future world history, was first acclaimed emperor when still a general by his troops in Britain – and in York! – The most distinctive feature of early medieval Christendom was the explosion of the monastic movement in the 300s-500s – possibly as a response to Christianity becoming decriminalised in the early 300s, and then becoming the official state religion of the Roman Empire by 380. There was no more scope for martyrdom. But you could still mortify your own worldly ambitions (and those of your parents) by chucking in a promising career as a lawyer, or even as a bishop, and disappearing into the obscurity of a world-denying enclosed religious order. The establishment of monasteries went hand in hand with the more orthodox spread of dioceses across Western Europe, a movement associated with men like St Martin, bishop of Tours from 371 until 397. – It was fascinating to learn how much this activity was associated with wealth; often the bishops came from very rich families, or they performed miracles which converted the very rich and powerful, who themselves went on to commission churches and monasteries. Despite Christian propaganda, the Church from the early medieval period was associated not with the poor and slaves, but with money and power. This is emphasised by the string of textbooks, sermons and papal letters Fletcher quotes in the middle of the book which were aimed at trying to bring a very worldly clergy under control – no attending communion drunk! Cut down on the hawking and hunting! – Ulfilas (311-83), the apostle of the Goths, who translated the Bible into a Gothic script which he invented for the purpose. Except that his translation of the Bible notoriously excluded the Books of Kings, which are mostly a record of ancient Israel’s wars. The Goths didn’t need any encouragement in that direction. – The Latin word peregrinatio began life as a definition of a type of citizen, an alien or exile from their homeland living within the Roman Empire. In the early parts of his book Fletcher shows how it was taken over to describe the new idea of an ‘exile from Christ’, a person who devoted their lives to travelling and preaching and which became applied to what we would now call ‘missionaries’, men like St Patrick or the Englishman Winfrid, born in Wessex in the 7th century, who took the Latin name Boniface and travelled across North Europe to take a leading role in the conversion of the pagan Saxons, earning himself the title of the Apostle of the Germans. He was ‘martyred’ in the 750s. But towards the end of this long book, Fletcher pauses to consider how the word peregrinatio continued to change its meaning so that by the 11th century it was being applied to planned journeys by groups of people to sites of veneration, churches and shrines erected to the martyrs and saints of what was by now a mostly settled, Christian Europe. These journeys began to be called peregrinatios, translated into Middle English as pilgrimages. What had once been wild journeys into the unknown had become package holidays. The final part of Europe to be converted to Christianity was up in the north-east, in northern Poland, in Livonia, along the Baltic and into the big and successful Duchy of Lithuania. Fletcher’s final chapter paints a rather grim picture of how this final proselytising effort was darker and more violent than what had come before, mainly under the influence of the Crusades. He has to take a detour to explain how the rhetoric of anti-Muslim Crusade came to be redirected towards the last pagan kingdoms – and also how the Crusades witnessed the birth of a new phenomenon, bands or ‘orders’ of knights banding together to either fight in the Holy Land or, like the Knights Templars, to protect pilgrims and other travellers to Palestine. Thus military orders grew up in the north-east devoted to converting the pagan, by fierce military means if necessary, the most notable examples being the Sword of the Brethren and the Teutonic Order. This Wikipedia map gives a good picture of the geographical territories involved and the way ‘conversion’ had been reduced to a military campaign. Astonishingly, the Grand Duchy of Lithuania held on to its pagan status and religion until as late as 1386 when the Grand Duke seized the purely contingent opportunity of marrying the ten-year-old girl who’d inherited the throne of Poland and had to submit to baptism as part of the political deal. But these last few centuries of the story are redolent of war, conquest, seizure of territory, rebellions by the conquered put down with brutality. As Fletcher points out, the castles built by these orders in their conquered territories bespeak imperial colonisation, like the contemporary Plantagenet colonisation of Wales. It is a long long way from the heroic solo missions of St Patrick or St Martin, or the better resourced but still peaceful missions of St Augustine or St Boniface. The licensing of military violence by the pope and Church hierarchy is ugly, and sets the scene for the lamentable invasions of the New World which began barely a hundred years later. All of which, paradoxically, makes the Christianity of the so-called Dark Ages (400 to 1000) seem much sweeter and gentler by comparison. With a few notable exceptions (like Charlemagne’s genocidal ‘conversion’ of the Saxons in the 780s) the converters of the 6th, 7th and 8th centuries were more likely to be solitary holy men impressing pagan mobs by raising the dead or averting hail storms or stopping floods or bringing good weather. Although their miracles may be doubted, the bravery and faith of these early apostles can’t be, and there is something very admirable about it and them, which is worthy of respect. 406-7 the Rhine freezes and barbarian pagan Germanic tribes swarm across it into Gaul. 410 The emperor Honorius withdraws the Roman armies from Britain to defend Rome from the barbarians. 410 Rome is sacked by the the Visigoths under Alaric. 451 The Battle of Châlons in 451 – one of the last major military operations of the Western Roman Empire when Romans under general Flavius Aetius and the Visigothic king Theodoric I fought against the Huns and their vassals commanded by Attila. The battle stopped the Huns seizing complete control of Gaul and installed the Frankish king, Merovech, as king of the Franks, from whom later Frankish claimed descent (and called themselves the Merovingians). 476 The last Roman emperor in the West, Romulus Augustus, dies. 481-509 Clovis king of the Franks, pressurised by his Christian wife Clotilde, is baptised on Christmas Day 496 and – crucially – into orthodox Catholic Christianity, not the Arian heresy espoused by almost all the surrounding barbarian nations. This single decision helped to ensure that Europe became a Catholic continent. Clovis founded a new capital at Paris, and called a Church Council to bolster Catholic orthodoxy in his realm. 510s the Burgundians under King Sigismund convert from Arian to Catholic Christianity. St Columba (520-97) regarding himself as an exile and pilgrim, established monasteries in Ireland and at Iona, which was to become an important religious centre and shrine off the west coast of Scotland. 530s the Vandals convert from Arian to Catholic Christianity. 560s the Sueves convert from Arian to Catholic Christianity. 570s the Saxons of the Loire valley are converted to Catholicism by bishop Félix of Nantes. 580s the Visigoths of Spain convert from Arian to Catholic Christianity. 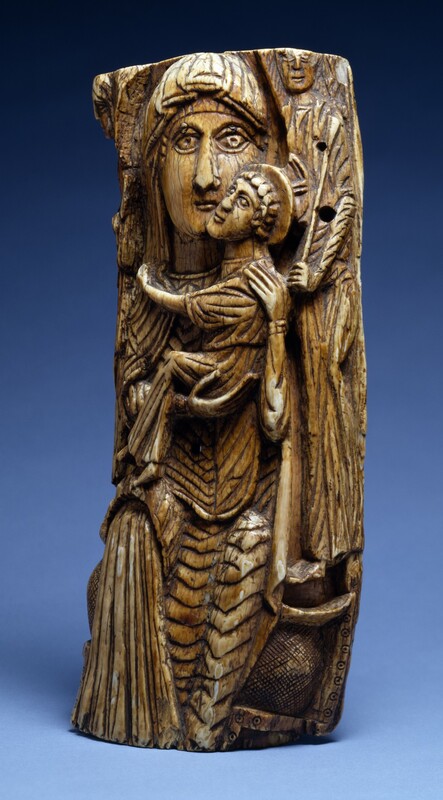 597 Pope Gregory the Great despatched St Augustine of Canterbury to Kent to convert King Ethelbert, at the bidding of his Frankish wife Bertha. 604 King Saebehrt of the East Saxons accepts Christianity and builds a church in London. Sometime before 605 King Redwald of the East Angles converts – though he later backslides and is in fact thought to be the pagan king buried at the famous Sutton Hoo ship burial. 627 King Edwin of Northumbria is baptised, again under influence of his Christian wife. St Columbanus (543-615) ‘an exemplar of Irish missionary activity in early medieval Europe’. St Aidan, founder of Lindisfarne monastery (active 635-651) ‘Apostle to the English’, friend of the Northumbrian kings Oswald and Oswine, who overthrew Edwin in 633. Benedict Biscop (628-90) founder of Monkwearmouth-Jarrow Priory in Northumberland. The Venerable Bede (672-735) the Northumbrian monk, historian and author of the vital Historia ecclesiastica gentis Anglorum (732). Although the book’s purpose is didactic, nonetheless Bede was unusually scrupulous in his weighing of the evidence before him. Saint Boniface (c. 675 – 5 June 754) an influential figure in North European history, who reorganised the Frankish Church, missionised into north Germany, and brought the Frankish dynasty and the papacy closer together, paving the way for the triumph of Charlemagne (747-814). 1. For a start, it gives a deeper sense of the importance of Christianity and why it spread to become the religion of Europe. It gives you a deeper sense of Christianity’s multi-faceted appeal – in providing a coherent narrative of the world to the illiterate and educated alike, assuring them of salvation and the help of God, Jesus and the Saints; giving rules to guide believers through the many problems of life, protocols and ritual to accompany all the way stations of life, from birth to death; assuring magic and miracle-working for those in need, suffering or pain – in numberless ways Christianity offered hope and solace and explanations and technologies (books, relics, crosses) for understanding and managing human life. Moreover, for pagan rulers, Christianity was the gateway into the legacy of Roman civilisation, into fabulous wealth, literacy, laws, coins and better ways of managing your realm, as well as access to the extensive trading networks of Christendom which eventually stretched from Iceland to the Black Sea. At a personal psychological level, at a social level in terms of law and order, and at the royal level of providing an entrée into the ‘club’ of European royalty, Christianity as belief system, legal system, cultural heritage and power network was infinitely richer, more complex and sophisticated than the pagan alternatives. 3. Since Europe went on to colonise the world and, in the last 70 years Europe’s child, America, has gone on to be the world’s dominant military and cultural force – studying early medieval Europe gives a deeper understanding of where it all came from, and why and how. 4. Study of this period teaches doubt and hesitation and respect for the profound uncertainty of human knowledge. Our sources are so limited; our ignorance of human activity through entire centuries so profound; the slightest discovery can so easily shed light on blank eras or overthrow widely-held views – that study of this period encourages what I take to be an appropriate attitude to human knowledge, which is one of deep scepticism. There is so much we don’t know and will never know. 5. We live amid the wreckage of all these centuries of ancestors and predecessors. We should respect their achievements, their cathedrals and statues and jewellery, their saints’ lives and often bizarre theology, because they are the heroic products of the human mind struggling in dark times. To my eye, their often primitive and unnerving artefacts have a haunting and mysterious beauty. These obscure messages from the remote past offer a strange and powerful hope for mankind’s survival.